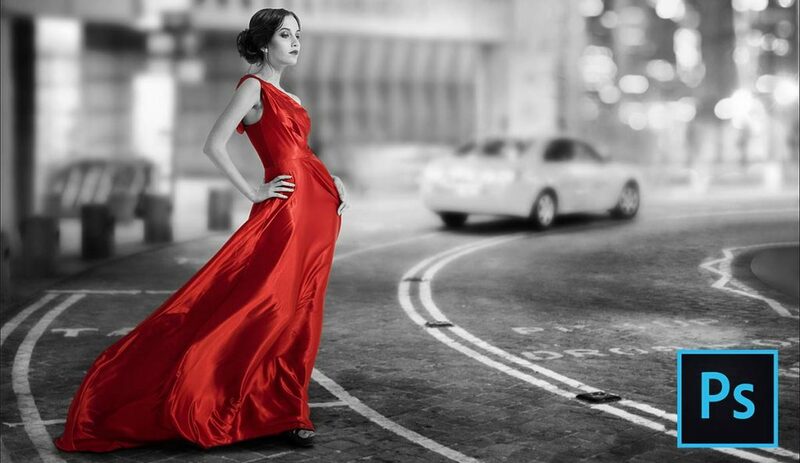 Learn how to easily add a selective color (or "splash of color") effect to an image with Photoshop! We'll convert the overall photo to black and white, and then we'll bring back the color in our main subject! Even though effects like this are very easy to achieve in Photoshop, many people shy away from them because they don't feel comfortable enough with Photoshop's various selection tools, or they're never sure which selection tool to use. So in this tutorial, we'll see how to create this effect without any selection tools at all! That's right, none! Instead, we'll be using nothing more than a simple Black & White adjustment layer, a layer mask and a brush! If you can drag a few sliders and paint with a brush, you have all the skills you need. I'll be using Photoshop CC here, but this tutorial is also fully compatible with Photoshop CS6. If you're using Photoshop CS5 or earlier, you can also follow along, or you may want to check out our original Selective Coloring Effect tutorial. Note, though, that the original version does require the use of a selection tool, so while the end result is the same, the steps are a bit different from what we'll be covering in this version. 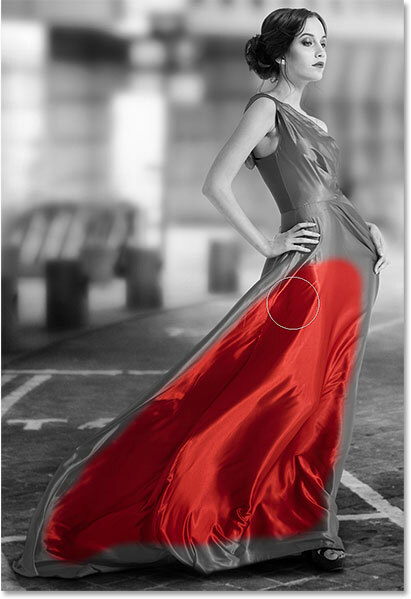 Photoshop adds the adjustment layer above the image. The initial, default black and white conversion. 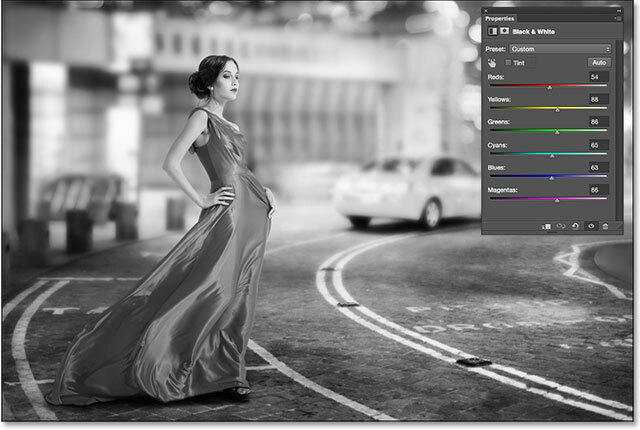 Drag the sliders to lighten or darken different areas based on their original color. Clicking the visibility icon to toggle the adjustment layer on and off. My adjusted black and white version. The mask thumbnail on the adjustment layer. Selecting the soft round brush. Photoshop uses our current Foreground color as the brush color. We need to paint with black on the layer mask, which means we need to set our Foreground color to black. To quickly do that, press the letter D on your keyboard. This will instantly set the Foreground and Background colors to their defaults, making the Foreground color white and the Background color black (these are the default colors whenever we have a layer mask selected). To swap them, press the letter X on your keyboard. Your Foreground color should now be black. To bring back the color in an object, start by painting over as much of its inner area as possible, avoiding the edges for now. Depending on the size of the object, it may help to use a larger brush for this part. You can change the size of your brush directly from the keyboard. Pressing the right bracket key ( ] ) repeatedly will make the brush larger, while pressing the left bracket key ( [ ) will make it smaller. To adjust the hardness of the brush edge from your keyboard, press and hold your Shift key while pressing the right bracket key ( ] ) repeatedly to make the edge harder or the left bracket key ( [ ) to make it softer. Painting with black over the lower half of the dress while avoiding the edges. Adding the upper part of the dress. The layer mask thumbnail showing the area we've painted over in black. To paint around the edges of the object, it often helps to zoom in closer. Here's some handy keyboard navigation tricks to make things easier. To zoom in on an area, press and hold Ctrl+spacebar (Win) / Command+spacebar (Mac) on your keyboard to temporarily access Photoshop's Zoom Tool and click on the area with your mouse. Click repeatedly to zoom in closer. To zoom out, press and hold Alt+spacebar (Win) / Option+spacebar (Mac) and click. To pan around the image while you're zoomed in, press and hold the spacebar on its own to temporarily access the Hand Tool, then click and drag the image around with your mouse. 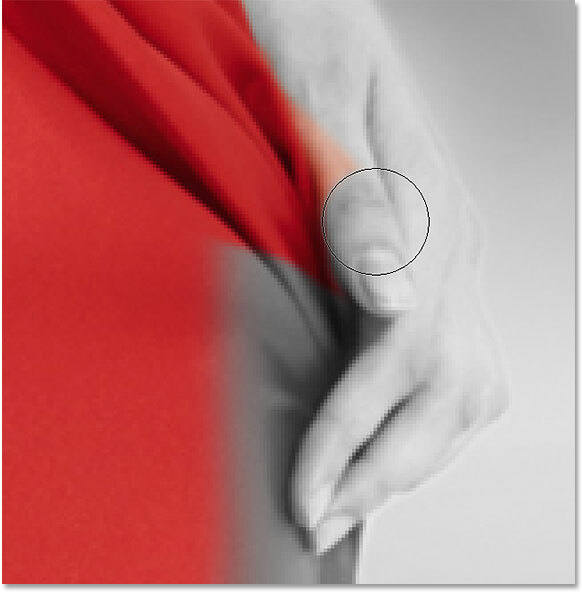 Carefully painting along the edges of the dress with a smaller brush. Oops! No problem, it's an easy fix. Fixing the mistake by painting over it with white. Continuing around the edges of the dress. The dress is now back in full color. Drag the sliders to fine-tune the black and white areas. The effect after lowering the opacity of the adjustment layer. And there we have it! 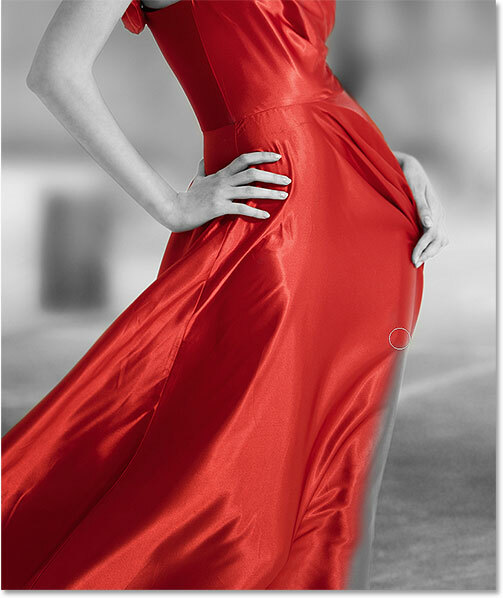 That's how to create a selective color, or splash of color, effect with no selection tools needed thanks to the power of adjustment layers and layer masks in Photoshop! Visit our Photo Effects section for more Photoshop effects tutorials!